The commemorative scheme now known as Blue Plaques, marking famous residences in London, was first proposed by William Ewart MP in 1863. It was hoped the 'memorial tablets' would encourage the preservation of the houses at a time when many old buildings were being destroyed. The scheme was initially administered by the Society of Arts, later the Royal Society of Arts, and run by a committee. 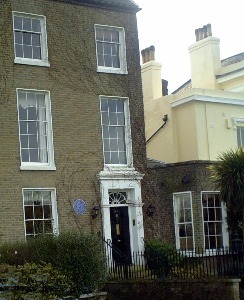 The first plaque was placed on the birthplace of Lord Byron in 1867 (demolished c1889). The oldest surviving plaque is to Napoleon III from 1867 and unique in being the only one erected in the candidate's lifetime. The Society of Arts set up 35 plaques of which 15 remain. The Grosvenor and Bedford estates had their own plaques as did the Corporation of London, although suggestions for these came from the S.A. The London County Council took over in 1901 and put up 268 plaques. During this time a standard design was adopted and in 1954 criteria formalised. This stipulated that no 'sites of' were to be marked as this practice had been controversial. The scheme was suspended during both world wars. In 1965 the LCC was replaced by the Greater London Council which covered a larger area and put up another 262 plaques. This included one to cricketer W G Grace, the first sportsman. Unfortunately the house in Sydenham was demolished soon after so the plaque was repositioned on his Mottingham home. Similarly one of their last plaques was for Mary Seacole (the first black person commemorated) whose house was demolished in the 1990s. Since 1986 the scheme has been administered by English Heritage who add about 20 each year, making the current total over 800. About 100 have been lost over time. To qualify a person must have been dead 20 years or have passed the centenary of their birth. The GLC relaxed this rule in some cases including for Gandhi who had only been dead 6 years. Each person can now have only one plaque (Gladstone has three) and they can have spent any length of time at the address. English Heritage incorporate the dates of residence when known. The owners/tenants of the property have to give their consent. Suggestions are considered by a panel and about a third are shortlisted. These must be of original structure and are generally residences. A prelimary report on the person is referred back to the panel and if accepted research is undertaken to determine the 'best' address. Because of the research involved it can take 2-6 years for suggestions to be implemented. Plaques are usually positioned on the ground floor unless the person commemorated occupied a particular part of the house. They can be adapted to the building style if necessary and if the property is demolished a new location is sought. About 10 properties feature two plaques. There is sometimes a ceremony to unveil a new plaque. The plaques for the Society of Arts were made by Minton Hollis & Co in a chocolate brown as this was less expensive. The border incorporated the lettering of 'Erected by the Society of Arts' in its encaustic design. From 1901 most had a wreath & ribbon border and a few made in the mid 1920s had a coloured leaf wreath. Minton continued to make them until 1921 when Doultons of Lambeth took over. In 1938 a new simpler design (without the wreath) was introduced with the first one being used for Mozart at 180 Ebury Street. Initially these were brown but changed to blue post war. When Doultons relocated to the Midlands in 1955 the contract was passed on to Carters Tile Co Ltd of Poole then between 1982-94 they were made by Alan Dawson in Stafford. They are now made by independant craftspeople in Blackheath and Burton-on-Trent and take about 2 months to produce. Some early LCC ones were made in bronze but this was too costly and the legibility was poor. The glazed ceramic plaques are 50mm thick and 495mm diameter. The circle is a symbol of eternity and blue is the colour of peace, constancy and serenity. 'London Blue Plaque Guide' by Nick Rennison. 'Track the Plaque' by Derek Sumeray has 32 walking routes featuring plaques. 'Lived in London - Blue Plaques and the stories behind them' by Emily Cole features 800 plaques arranged geographically. It is however a 'coffee table' book. 12 Westwood Hill was the boyhood home of the Antarctic explorer Sir Ernest Shackleton (1874 - 1922). It is a large house but Shackleton's father Henry practised as a GP from there and the family consisted of 2 sons and 8 daughters as well as servants. 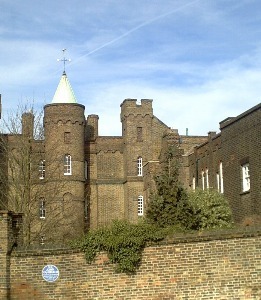 He attended nearby Fir Lodge School (since demolished) and then Dulwich College. Sir James Clark Ross (1800-62) entered the Navy at the age of 11 and served initially with his uncle. He explored the Arctic from 1818-33 (discovering the North Magnetic Pole) and the Antarctic from 1839-43. He was knighted and married on his return and lived at 2 Eliot Place, overlooking Blackheath, for some 3 years. He made a further voyage in 1848 in search of the lost Franklin expedition. He died in Aylesbury.